Sorry lovies for the recent lack of posts! It has been a hectic few weeks and is going to continue to be so!! We love to travel and we have been and will continue to get do lots of it!! I was reading the lovely Liesl's blog the other day Fabulous Fashions for Sensible Style and read this post on a great idea of what to do with your extra candle holders! I have been burning my almost empty candles all day (my house smells delish!) so I can try it myself! 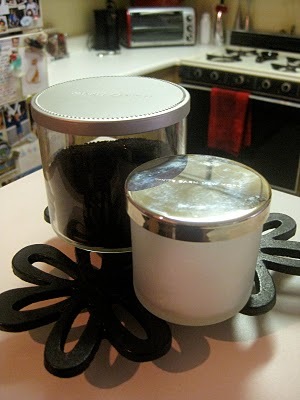 You must pop over to her site and read how to re-use your old candles jars! She also has a fabby giveaway going on right now so make sure you stop over and get yourself entered to win!! Glad you liked the idea and wanted to pass it on...I'll post more crafty things soon! Hope you are having a Wonderful Week!!! Thank you!! I adore this idea and your blog!!! Hope your week is great! !